Kotaku 'Shop Contest: The Next New 3DS: The Winners! 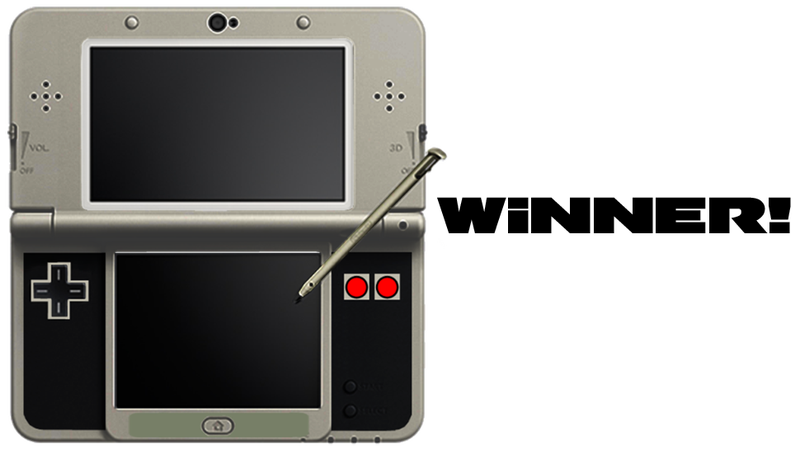 Following last week's reveal of Nintendo's New 3DS, I asked our photo manipulation-savvy readers to take us beyond that announcement to the next next 3DS. They did not disappoint. Well, most of them didn't. The most non-disappointing entry of them all this week comes from Arch Duke Maxyenko, who correctly guessed (probably) that the only step Nintendo could possibly take after presenting us with pure perfection (maybe) was backwards. Sure, we'll go with that. Of this week's finalists, the only truly disappointing one comes from Arniejolt, because Arniejolt is mean. The rest of you, excellent job! Nanttene — for making me read an entire thing. Cutthroat Bill — because three screens is awesome and the most you can have. Nellchan — because I was wrong about the three screens thing. Wiisley64 — because everyone wanted a full-sized second analog stick. Viker — because I'd probably buy it. kanellos — off topic, but I'd hit it. MrDeadScott — because the world needs more PKE meters. Zekial — because that 32x thing sure sounds handy. pep123 — because this idea intrigues me. Sakis — because sliding displays amuse me. Robi Joseph — because curved screen technology is the future or something. Cartoonivore — because I bet this would sell like hotcakes at a vomitorium. FlyingDorkProd — EVERY BUTTON MUST BE SKITTLES. arniejolt — because you're a monster. scieteach — because nothing could go wrong with this idea. BrunoHM — for doing what that other person did, only better. Rattmann — because every 3DS should come with an Alienware system. Orionsangel — someone needs to make me one of these. Kireek — though I don't know what Nintendo would do with that many pixels. Ganonthegreat1 — yes, but you could have just clipped it off! GiantBoyDetective — because how does that even work? narffet — because that's about the size of it. Remy LeBeau — because you can never have too many extras. Arch Duke Maxyenko — for the win. See yo tomorrow with a new contest! And remember — images must be at least 636 pixels wide, or they shall be disqualified. Several cool entries were cut due to sizing issues, and it hurts my heart.